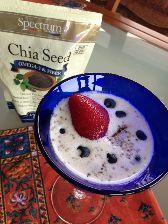 In a medium size bowl, add the chia seeds then the desired nut or seed milk. Let it sit for 5 - 8 minutes. Stirring occasionally as the chia seeds will gel up and thicken into a porridge consistency. Garnish with berries and drizzle with honey or maple syrup. Enjoy! Chia seeds are high in fibre, protein and in omega 3s which is great for brain development. Chia seeds are filling and can act as an appetite suppressant. If enjoying at night, leave out the fruits as they should not be consumed so late at night.